“You should play the violin for our church’s orchestra!” A man at church had told me one Sunday morning after discovering I played the violin. Being a shy freshman in high school at the time, I made excuses of not being a good enough player and too busy with sports and school. With a kind smile he said, “When God gifts us with talents we should use it for Him.” He encouraged me before we parted and we made our way into Evergreen SGV’s sanctuary for service. Eight years ago, Rick Tsushima was this man who encouraged me to use my gifts for God’s glory. Rick was a devoted and loved member at Evergreen SGV for many years and whom many of you perhaps have known. Just a few months after our brief conversation at church I was saddened and shocked to hear he had gone home to be with the Lord. Since then, God has placed a continual conviction in my heart to not only use my violin to praise Him but to use my words, actions, and every other ability I have to honor the One who has given me the capability to do so. These simple words from a man I hardly knew began to mold a growing conviction in my heart as time went on. However, excuses like hardly knowing anyone, feeling inadequate to play, afraid to be on stage, and being busy hindered me from obedience. 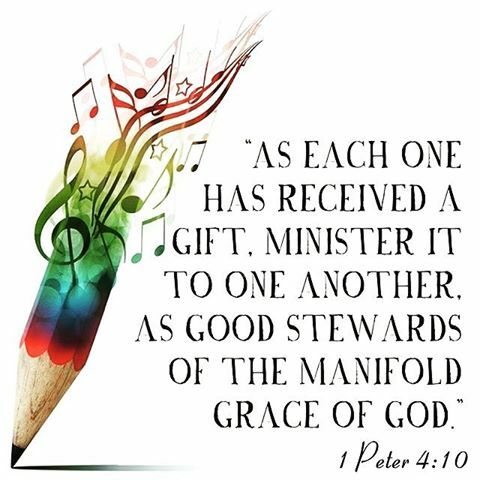 The verse from 1 Peter 4:10 as well as Rick’s kind encouragement continued to speak to me: “Each of you should use whatever gift you have received to serve others, as faithful stewards of God’s grace in its various forms”. Finally, being able to play the violin in this past Christmas Eve Candlelight service was a huge blessing. Not only was it a special moment between me and the the Lord, but it was also amazing to play for our congregation alongside my little sister and some of the youth I had served in the Surge Jr. High ministry! It was a huge encouragement and a humbling moment to see the youth of our church using their gifts/talents to serve the Lord joyfully and without hesitation or excuses at their age. Reflecting back on this past Christmas Eve service, it was incredible to witness how individuals within our church family recognized their gifts and used them to glorify our Lord through various forms. Because of faithful obedience, many people within our church family served our God this Christmas season through the many opportunities Daniel Gee, our artistic director, provided for us. Although Christmas has come and gone along with the excitement of opening physical gifts, I remain encouraged by our church family’s obedience in using our Spiritual gifts for God no matter what season of the year it may be. Romans 12:4-8 states, “For just as each of us has one body with many members, and these members do not all have the same function, so in Christ we, though many, form one body, and each member belongs to all the others. We have different gifts, according to the grace given to each of us. If your gift is prophesying, then prophesy in accordance with your faith; if it is serving, then serve; if it is teaching, then teach; if it is to encourage, then give encouragement; if it is giving, then give generously; if it is to lead, do it diligently; if it is to show mercy, do it cheerfully.” I am forever thankful for people in my life like Rick Tsushima, who obeyed the Lord even in the smallest of things and made an impact in my life. From this experience I realized that even the smallest words of encouragement can change someone’s faith for the better; and although we may never see the fruits of our labor, the Lord is pleased and lives may be changed by small acts of obedience. May our Heavenly Father always be glorified through the unique gifts he has given each of us; and may we as many members at Evergreen SGV continue to build one another up as one body of Christ!